Nestled on Khurdha uplands of' North -Eastern Ghats' biotic region, Chandaka forest is a relic of wild land that once extended all over Bhubaneswar. Spread over 193.39 sq.km of rolling table land and small sprawling hillocks of Khurdha and Cuttack Districts, it is a wildlife sanctuary since August 1982. 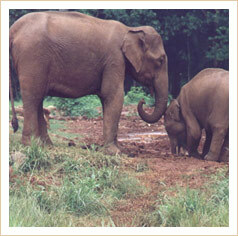 The sanctuary, literally abutting on the capital city of Odisha, is the pachyderm country. Originally established to provide inviolate refuge for elephants with a view to minimize their depredation, the sanctuary is now a treasure trove of biodiversity. It is now a popular destination for solitude seekers, hunt for eco-tourists, and laboratory for researchers and temple of learning for all. Rigid protection and conservation management for two decades; sculpture in green was taking shape. Symphony of nature has manifested with the revival of forest ecosystem and habitat niche. Vegetation, which was rendered bushy due to over exploitation has gained height beyond recognition. Reappearance of Sal, Bamboo, Maha limba, Canes and a great array of plant life including medicinal plants bear testimony to the recuperating energy of nature. This small but beautiful sanctuary has forest types well distributed in a mosaic of habitat sheltering variety of tropical Indian jungle fauna. The return of the leopard in 1991, which seemed extinct for long, further reaffirms the revival of bio-diversity. The home of the elephant, the lord of the jungle and that of lesser wild animals has thus been saved. Floral diversity is distributed in 6 types, viz., secondary moist miscellaneous semi- evergreen forests, moist Kangada (Xylia xylocarpa) forests, Coastal Sal forests, thorny bamboo brakes (Bambusa bamboos), planted Teak and Eupatorium scrub. Main tree species are Kochila, Kalicha, Bela, Kangada, Giringa, Sunari, Sal, Kumbhi, Jamu, Karanja, Teak and Sidha. Male bamboo (Dendrocalamus strictus) has a very restricted distribution. Common medicinal plants of the sanctuary are Duramari, Baidanka, Brudhadaraka, Bhuinlimba, Guluchi lata, Salparni, Satabari, Bhuin-kakharu, Indrajaba, Thalkudi, Apamaranga, Kurchi, and Patalgaruda etc. A few species of ground Orchids, Ferns, Club mosses, Bryophytes and Lichens are distributed in shady wet pockets and rock escarpments. Elephant is the flagship species and indicative of the potential productivity of the habitat. Leopard is in the apex of biological pyramid. Chital, Barking deer, Mouse deer, Wild pig, Common langur, Rhesus monkey, small Indian civet, Common Indian mongoose, Small Indian mongoose, Ruddy mongoose, Pangolin, Sloth bear, Ratel, Indian wolf and Hyena are other mammals of the area. Wild dogs are occasionally seen. Prominent birds of the sanctuary are Peafowl, Red jungle fowl, Crested serpent eagle, Great horned owl, Black headed oriole, Paradise fly catcher, Coucal and stone curlew. Among reptiles, Rock python and Bengal Monitor lizard are quite common. Chameleon, Common skink, Indian flap shell turtle, Russel's viper, Bamboo pit viper, Common krait, Common vine snake, Kukri snake, Indian bronze back are indicative reptiles. Mugger crocodiles have remarkably adapted to large water bodies after their release. Chital or spotted deer, the most beautiful of all deer is commonly encountered in groups of 3-7 on forest roads, forest openings, grass lands, foreshore of water bodies and even near guard camps. Godibari, Kochilaberana, Ambokhali, Baunsha-berana, Mahuriabadi, Kumarkhunti, Jhalara, Ambilo and Saurabiula are places of good sighting success. The 'Gayal' or Indian Bison has been lost since long. Kheluachua, the mud wallow of playful Sambars exists but not the animals. The last tigress of the forest 'Kanan' embraced captivity in search of a mate at Nandankanan in 1968. This is history. The presence of Leopard - the prince of cats, which has staged a come back and filled the vacant niche left by tiger, can be known from pug-marks. Look for it on the edge of water or on pug impression-pads (P.I.P) across roads. Expect the leopard at Kheluachua, Gadanbhanga, Ambilo, Chhatiani and Bualigarh. You may find one if lucky. Elephants are always on the move feeding. Look for their feeding signs i.e., leftovers of twigs, pulled bamboo culms, uprooted saplings, debarked trees. Food plants of elephants include Bamboo, Moi, Ghonto, Dhobani, Siris, Mahul, Dhaman, Beta and Lajkuli (leaves and growing shoots), Kapasia, Panikodal, Kumbhi, Dhaman, Ghodalanjia(Bark), Kanchan, Gohira, Amba and Bela (fruits). Fresh foot-prints and dung bolus also indicate their presence. Expect them at water-holes in hot summer after noon and evenings. You may be lucky to see a tusker or even a family unit. The Plumaged wonders - The avian life of the sanctuary is no less significant. Kumarkhunti reservoir, in winter, serve as transient roosting and feeding ground for several migratory duck species, notably, Garganey and common Teal, Pintail, spot billed and brahmny Duck and white eyed Pochard. Lesser whistling Teal, Dabchick, Cotton Teal, Nakta, lesser Cormorant, bronze winged Jacana, white breasted Waterhen, pied, white breasted and little blue King fishers and red wattled Lapwings are other resident birds around. Come July, and the surrounding bamboo brakes of the reservoir transform in to a heronry of water birds, mainly, open billed Storks, pond Heron, Egrets and Cormorants. A plethora of insects are also found here. Most of them are abundant during monsoon and post monsoon months within a height of 3 meters from ground. Look for them in forest openings, road sides, flowers, grasses, edges of water, wet mud, bird and animal droppings or food plants either feeding or basking. Common ones here are common Mormon, blue Mormon, common Emigrant, common Leopard, common Hedge Blue, Indian Crow, double banded Crow, common Sailer, common Bush brown, grey Pansy and peacock Pansy. While Kochilaberana, Pitagadia and Charichhak watch towers are excellent for observation of birds and animals, the ones at Kumarkhunti and Amblio have the comfort of rest houses where one can make a night halt and have a date with wild animals and birds without disturbing them. The Kabaries, claiming ancestry with Jarasabar , the first worshiper of 'Lord Jagannath' in shape of Brahma (Wooden idol) are unskilled tribals. There are 455 families resident in the enclosed Gadjat village. There are many Kabari villages in the periphery of the sanctuary. They practice subsistent and marginal agriculture. Many of them earn a livelihood by collection and sale of firewood, bamboos and charcoal. Good many of them are excellent animal trackers and herbal healers. Bewildering variety of plants and animals exist in a state of harmony with intricate system of energy flow and dependencies - some known but lot unknown. We being part of nature and not apart from it, our very existence is dependent on unhindered functioning of the system. Diversity is the key stone of stability in the ecosystem and a measure of conservation success. Look for the connection between two life forms. Location : Lat 200 -12' to 200 - 26' N, Long 850 -34' to 850-49'E. The best time to visit this verdant sanctuary is October to May. Rigid protection and conservation management for two decades; sculpture in green was taking shape. Symphony of nature has manifested with the revival of forest ecosystem and habitat niche. Vegetation, which was rendered bushy due to over exploitation has gained height beyond recognition. Reappearance of Sal, Bamboo, Maha limbo, Canes and a great array of plant life including medicinal plants bear testimony to the recuperating energy of nature. This small but beautiful sanctuary has forest types well distributed in a mosaic of habitat sheltering variety of tropical Indian jungle fauna. The return of the leopard in 1991, which seemed extinct for long, further reaffirms the revival of bio-diversity. The home of the elephant, the lord of the jungle and that of lesser wild animals has thus been saved. Floral diversity is distributed in 6 types, viz., secondary moist miscellaneous semi- evergreen forests, moist Kangada (Xylia xylocarpa) forests, Coastal Sal forests, thorny bamboo brakes (Bambusa bamboos), planted Teak and Eupatorium scrub. Main tree species are Kochila, Kalicha, Belo, Kangada, Giringa, Sunari, Sal, Kumbhi, Jamu, Karanja, Teak and Sidha. Male bamboo (Dendrocalamus strictus) has a very restricted distribution. Common medicinal plants of the sanctuary are Duramari, Baidanka, Brudhadaraka, Bhuinlimbo, Guluchi lata, Salparni, Satabari, Bhuin-kakharu, Indrajaba, Thalkudi, Apamaranga, Kurchi, and Patalgaruda etc. A few species of ground Orchids, Ferns, Club mosses, Bryophytes and Lichens are distributed in shady wet pockets and rock escarpments. Chital or spotted deer, the most beautiful of all deer is commonly encountered in groups of 3-7 on forest roads, forest openings, grass lands, foreshore of water bodies and even near guard camps. Godibari, Kochilaberana, Ambokhali, Saunsha-berana, Mahuriabadi, Kumarkhunti, Jhalara, Ambilo and Saurabiula are places of good sighting success. Elephants are always on the move feeding. Look for their feeding signs i.e., leftovers of twigs, pulled bamboo culms, uprooted saplings, debarked trees. Food plants of elephants include Bamboo, Moi, Ghonto, Dhobani, Siris, Mahul, Dhaman, Beta and Lajkuli (leaves and growing shoots), Kapasia, Panikodal, Kumbhi, Dhaman, Ghodalanjia(Bark), Kanchan, Gohira, Ambo and Bela (fruits). Fresh foot-prints and dung bolus also indicate their presence. Expect them at water-holes in hot summer after noon and evenings. You may be lucky to see a tusker or even a family unit. Birds,the Plumaged wonders - The avian life of the sanctuary is no less significant. Kumarkhunti reservoir, in winter, serve as transient roosting and feeding ground for several migratory duck species, notably, Garganey and common Teal, Pintail, spot billed and bramhiny Duck and white eyed Pochard. Lesser whistling Teal, Dabchick, Cotton Teal, Nakta, lesser Cormorant, bronze winged Jacana, white breasted Waterhen, pied, white breasted and little blue King fishers and red wattled Lapwings are other resident birds around. Come July, and the surrounding barnboo brakes of the reservoir transform in to a heronry of water birds, mainly, open billed Storks, pond Heron, Egrets and Cormorants. A plethora of insects are to be found here. Most of them are abundant during monsoon and post monsoon months within a height of 3 meters from ground. Look for them in forest openings, road sides, flowers, grasses, edges of water, wet mud, bird and animal droppings or food plants either feeding or basking. Common ones here are common Mormon, blue Mormon, common Emigrant, common Leopard, common Hedge Blue, Indian Crow, double banded Crow, common Sailer, common Bush brown, grey Pansy and peacock Pansy. The Kabaries, claiming ancestry with Jarasabar (sawar) the first worshiper of 'Lord Jagannath' in shape of Brahma (Wooden idol) are unskilled tribals. There are 455 families resident in the enclosed Gadjit village. There are many Kebari villages in the periphery of the sanctuary. They practice subsistent and marginal agriculture. Many of them earn a livelihood by collection and sale of firewood, bamboos and charcoal. Good many of them are excellent animal trackers and herbal healers. Bewildering variety of plants and animals exist in a state of harmony with intricate system of energy flow and dependencies - few known but lot unknown. We being part of nature and not apart from it, our very existence is dependent on unhindered functioning of the system. Diversity is the key stone of stability in the ecosystem and a measure of conservation success. Look for the connection between two life forms. Temperature : Max. 40' C (Summer day in April- May), Min. - 10' C (Winter nights in Dec- Jan). Rainfall Average : 1400 mm. The best time to visit this verdant sanctuary is October to early June. By Road : Chandaka in about 20 km by road from Bhubaneswar, which has good inter-state road linking all major cities in India. By Rail : Nearest Railhead is Bhubaneswar (20 kms) on East coast Rly., which has super fast trains connecting all major cities. By Air : Nearest airport is Bhubaneswar (20 km) . Accommodation in Forest.Rest.House. at Deras & Minchinpatna is available on prior reservation. Watch Towers at Ambilo and Kumarkhunti each having two double bedded rooms are available on prior booking to small groups not exceeding 5 persons for over night. Bhubaneswar has a number of hotels of star and general category to suit individual needs. Transport: A/C. Non A/C cars, coaches available on hire from leading recognized travel agencies at Bhubaneswar. Divisional Forest Officer, Chandaka Wildlife Division, S.F.T.R.I campus, Ghatika, Bhubaneswar 751003, Tel: 2551600. Tourist Office, Government of Odisha behind Pantha Nivas,, Bhubaneswar Tel: 2431299. Manager, India Tourism Office, B 21, BJB nagar, Bhubaneswar tel: 2432203. Surrounded by paddy fields, the Dhauli hill brings back memories of the historic 'Kalinga war' which was fought around here. It is here that Ashoka, the terrible, was transformed into Ashoka, the compassionate and championed the cause of Buddhism. On the foot of the hill, one can see the Rock Edicts of Ashoka and the forepart of a skillfully sculpted elephant hewn out of a huge rock. Dhauli has gained prominence due to the establishment of a Buddhist Peace Pagoda, popularly known as Shanti Stupa, built in the early seventies by the Japan Buddha Sangha and Kalinga Nippon Buddha Sangha. An old temple of Lord Dhavaleswar, reconstructed in 1972, also stands on the hilltop. Hirapur (15 km)* - Hirapur has the 9th century Hypaethral temple of sixty four Yoginis. It is second of its kind in Odisha and one of four such unique temples in India. Atri (42 km)* - Situated amidst greenery and famous for the hot sulphur water spring, Atri, 42 km. from Bhubaneswar and 14 km. from Khurda, is also a holy place with the shrine of Hatakeswar. A bath in the spring water is reputed to cure skin diseases apart from being a pleasant experience. Nandankanan (20 km)* - Picturesquely carved out of the Chandaka forest, Nandankanan is a Zoological Park where animals are kept in their natural habitat. A centrally located lake divides the Zoo from the Botanical Gardens. Tigers, Lions, Clouded Leopards, Black Panthers, European Brown Bear, Himalayan Black Bear, Gharials, Rosy Pelican, Grey Pelican, Indian Python, King Cobra, etc. are among the attractions of the zoo, which is famous for its White Tigers. The exotic Botanical Garden on the other side of the zoo preserves varieties of indigenous plants. Regular bus services are available to reach the sanctuary. Khandagiri and Udaygiri (8 km)* - The twin hills of Kumargiri and Kumarigiri known as Khandagiri and Udaygiri contain varieties of rock-cut caves, built mainly for the Jain monks around 1st - 2nd century B.C. The thirteen years lithic record of Emperor Kharavela engraved in Hatigumpha (elephant cave) is a magnificent specimen of Pali records so far found in India. (1) Collect in advance the entry permit, permission for photography, reservation in Forest Rest House. (3) Obey Wild Life guidelines in force. One can avail of simple yet tasty meals at the F.R.H (Forest Rest House) at Deras and Minchipatna. 14. Don't get off your vehicle at any point in the Park except where it's allowed. This is for your own safety and the safety of wildlife. At the height of their power in the 15 th century AD, the Gajapati Kings of Odisha ruled over a kingdom, extending from the Ganges in the north to the Kaveri in the far south. But already in the early 16 th century, the Gajapatis lost great portions of their southern dominion to Vijayanagar and Golkonda. The dismemberment of the Odia-speaking central region began immediately after the downfall of the kingdom in 1568, when the present Ganjam district was conquered by Golkonda and when, in the early 17 th century, the districts north to the river Subarnarekha were annexed to the Bengal Sub Area of the Mughal Empire. The fate of Odisha was further determined in 1751 when the Marathas merely conquered central and western Odisha whereas southern and northern Odisha remained under the rule of the Nizam of Hyderabad and the Nawab of Bengal respectively. And when, in the year 1803, Odisha was finally conquered by the East India Company, the districts of Ganjam and Midnapore, already several decades ago, had become part of its fast expanding territory. The East India Company had no intention of unifying the Odia-speaking territories which it had conquered piece by piece during a period of more than half a century. On the contrary, after further reorganization of those Odia-speaking areas which lay outside the Odisha Division, the Odias were administered by five separate political authorities, i.e. Bengal and its Odisha Division, Chota Nagpur, the Central Provinces, Madras and the Garhjat Mahals of feudatory states of Odisha. The formation of the linguistic province of Odisha in 1936 may be regarded as one of the landmarks in the history of the evolution of the Indian Union. The demand for linguistic states, which became so conspicuous in India after independence had its genesis in the movement of the Odia-speaking people for a separate province on the basis of language during the later half of the British rule. This movement had a long and chequered history ranging from the last quarter of the nineteenth century till the new province was created on the 1 st April, 1936. The British conquest of India was carried on according to prevailing political situations as well as military conveniences of the conquering power. In the process of territorial conquests the traditional compositions of the socio-cultural affinities of the various Indian people were very much neglected. As one of the major linguistic communities of the Indian subcontinent, but placed under several administrative jurisdictions, the Odia people suffered the injustice of dismemberment for nearly a century since the British conquest of Odisha in 1803. Ganjam and other Odia-speaking areas south of the Chilika lake remained tagged to Madras; Midnapore to Bengal; Singhbhum, Seraikela and Kharsawan to Chota Nagpur Division; Sambalpur and Chhatisgarh feudatory states to the Central Provinces. Thus, when the British occupied Odisha in 1803 it was confined to the three coastal districts of Puri, Cuttack and Balasore. Various prophets visited Odisha; the significant among those visits is the visit of Adi Sankaracharya in 9th century to Puri to make it a center of his mission and a towering citadel of his spiritual ideology & message. He established four monasteries in four corners of Indian Peninsula out of which "The Gobardhan Pitha" of Puri was one of the most significant. Another Great Saint Ramanujacharya, the proponent of Visista Dwaita philosophy also visited Puri and established the Emar Matha. In the same century Jayadev composed his world famous lilting treatise "Gita Govinda". Subsequently in 16th century Sri Chaitanya, the exponent of the Bhakti Cult came to Odisha and made Puri his abode for last 18 years of his life. His contemporary Pancha Sakha i.e. Sri Jagannath Das, Sri Achyutananda Das, Sri Balaram Das, Ananta and Yasobanta were spiritual stalwarts and literary luminaries of the time. Kabi Samrat Upendra Bhanja, Kabi Surya Baladev Ratha, Radhanath Ray, Fakir Mohan Senapati, Pandit Gopabandhu Dash, Pandit Nilakantha Das, Godabaris Mishra, Kalandi Charan Panigrahi, Sachidananda Routray & many others have contributed substantially to the language & literature of Odisha. Utkal Gaurav Madhusudan Das was the architect of Modern Odisha and subsequently Sri Nabakrushna Chowdhury, Dr. Hare Krishna Mahatab, Sri Bijayananda Patnaik and others engineered their best efforts for catapulting Odisha to Himalayan heights of fame. In fact, Odisha has become a multi dimensional, multi colored, vibrant and boisterous modern state all set on its journey in the present millennium to make its presence and voice felt in the nooks and crannies of the world through the Universal Cult of brotherhood, its unique cultural heritage, luxuriant forests & wild life, sprawling Chilika Lake, bountiful coastline, wide range of tribes & colorful canvass of art & culture. Odisha has been resurgent again rejuvenating and resuscitating its ancient glory, glamour and greatness. But no step was taken for the transfer of Odia-speaking areas from Bengal and Bihar. By this recommendation the total area was raised from 55,799 to 84,677 sq. km. (21,545 to 32,695 sq. miles). In the lines of the recommendations of the Committee, the Government of India Bill 1935 was passed by the Parliament and the new province of Odisha as an administrative unit came into being on the 1st April, 1936 with the following areas as per the Government of India (Constitution of Odisha ) Order,1936. Chatrapur, Asika, Sorada, Kodala and a portion of the Taluks of Ichhapur and Brahmapur as laid to the north and west of the line described in Part-II of the Schedule. Since then throughout the pre-independence days Odisha has suffered a lot as it was not possible to put together all the Odia-speaking areas under a single administration. There were only six districts, viz., Cuttack, Puri, Baleshwar, Sambalpur, Ganjam and Koraput. The old district of Anugul was split up into two statutory districts, viz. Anugul and the Khondmals under the Angul Laws Regulations, 1936 and the Khondamals Laws Regulations, 1936 respectively. But for administrative purposes Angul was tagged to Cuttack district and Khondamals to Ganjam district. The Collectors of Cuttack and Ganjam became respectively the ex-officio Deputy Commissioners of those two areas. The rest of the province constituted 26 princely states, governed by the Rajas and Maharajas who had the last word of law within the jurisdiction of their respective princely states. They were loosely knit and administered under Political Agent of the British Government who was mostly satisfied after the collection of a predetermined part of the total revenue collection known as tribute or Nazarana from the rulers of those states. The process continued till 1947 when the country got independence. The report of the Simon Commission led to the summoning of the Round Table Conference. Krushna Chandra Gajapati Narayan Dev, the Maharaja of Paralakhemundi represented Odisha in the Conference. The Maharaja circulated the pamphlet, "the Odias, their needs, and reasons for a separate province." His efforts bore fruit: before the Third Round Table Conference ended, the Odisha Boundary Commission was appointed to review the boundary lines of the proposed Odisha province. According to the suggestion of the Simon Commission the Odisha Boundary Commission was appointed with O¿Donnell as the Chairman. The Committee examined the claims of the Odias and finally recommended for inclusion in Odisha of the plains and the agency areas, excluding Paralakhemundi, in the Ganjam district; and Kharial and Padmapur, excluding Phuljhar in the Central Provinces. But the Commission opposed the inclusion in Odisha of the Odia-speaking areas in Bihar and Bengal. The report of the Committee was vehemently opposed by the Odias. The "white paper" was published on the 17 th March, 1933, containing the draft proposals for the reform of the Indian Constitution. It proposed to create two new provinces, viz., Sind and Odisha. But the proposal regarding the boundary of Odisha was far from satisfactory. It excluded the Vizagpatam Agency and Paralakhemundi estate and the Jalantar Maliah in the Ganjam agency from the proposed Odisha province. When the "white paper" was under review of the Joint Parliamentary Committee, an Odia delegation consisting of seven members met the Secretary of State under the leadership of the Maharaja of Paralakhemundi on the 3 rd July, 1933 and submitted a representation. In the meantime, the Utkal Union Conference Committee met and authorized the Maharaja of Paralakhemundi to represent before the British Parliament for the inclusion of the Odia-speaking areas of the Ganjam district. The Maharaja by his powerful arguments convinced the Parliamentary Committee for the transfer of Jaypur (Jeypore) agency and a portion of Paralakhemundi to Odisha. The Commission after careful consideration made the following recommendations. A separate province of Odisha would, however, be perhaps, the most homogenous province in the whole of British India both racially and linguistically. They recommended that a new province of Odisha be constituted. They also recommended that there should be added to the Odisha Province, a portion of the Jaypur (Jeypore) estate which the O¿Donnell Committee proposed to transfer to Odisha, the Paralakhemundi and Jalantar Maliahs and a small portion of the Paralakhemundi estate including Parlakhemundi town. In creating consciousness for the amalgamation of the Odia-speaking areas, the district of Ganjam played a leading role. The people of Ganjam for the first-time organized meetings and passed resolutions for the unity of all the Odia-speaking areas. In September 1870, in the village of Russelkonda (present Bhanjanagar) under Ghumusar Taluk in the Ganjam district, a mass meeting was held. In the meting it was resolved to request the Odias of Cuttack to make united efforts for amalgamation. The Ganjam Odias formed an association called the `Ganjam Utkal Hitabadini Sabha¿ with the Raja of Kalinga, Venkates Beu, as its Secretary and carried on the agitation more vigorously. In the Odisha Division, on the 28 th November, 1874, there was a vast congregation of all the Rajas, Zamindars, and aristocrats in the garden of Bichitrananda Das to discuss the common problems of Odisha. In July 1877 an association called `Utkal Sabha¿ was formed under the leadership of Utkal Gourab Madhusudan Das. On the 16 th August, 1882 the Odisha Association was also formed by Mr.Das. In 1888 the Odisha Association made a representation to Sir Stewart Colvin Bailey, the Lieutenant Governor of Bengal, to unite all the Odia-speaking areas. On 15 th December, 1902 Raja Baikunthanath Dey submitted a memorandum to Lord Curzon to the same effect. In 1903 the Ganjam Odias sent a memorandum to Lord Curzon for the amalgamation. They also sent a copy of their memorandum to the people of Odisha Division. In the same year a meeting was held at Rambha in the Ganjam district under the leadership of the Raja of Khallikot and the `Ganjam Jatiya Samiti¿ was formed. Its first meeting was held at Brahmapur and Shyamasunder Rajguru of Paralakhemundi was its President. Delegates to attend this meeting from Odisha Division included such eminent persons as Utkal Gourab Madhusudan Das, Biswanath Kar, Nanda Kishore Bal and Gopal Chandra Praharaj. This meeting was regarded as the fist national conference of the Odia people. This was followed by the formation of the Utkal Union Conference at Cuttack on the 30 th December, 1903 under the leadership of Utkal Gourab Madhusudan Das. This conference played the most significant role for the amalgamation of the Odia-speaking areas. In 1901 Andrew Fraser, the then Chief Commissioner of the Central Province proposed to transfer Sambalpur to the Odisha Division. On 3 rd December, 1903 Lord Curzon in a scheme proposed to unite under a single administration the scattered sections of the Odia-speaking population while considering a proposal for the partition of Bengal. But the proposed scheme was partially carried into effect by the transfer of the Sambalpur district to Odisha Division on the 1 st September, 1905 minus the Chandrapur and the Padmapur estates and the Phuljhar Zamindari. In the same year the two feudatory states of Gangpur and Banei (Bonai) from the Chota Nagpur Division and the other five Odia feudatory states of Patna, Kalahandi, Sonapur (Sonepur), Bamra and Redhakhol (Rairakhol) were transferred to Odisha Division from the Central Provinces. The next great agitation for the amalgamation took place in 1911 when Lord Hardinge, the Governor General, created a new province consisting of Bihar and Odisha excluding the Odia-speaking areas of Midnapore, Ganjam and Vizagapatnam agencies; the states of Sarangagarh, Rayagarh, Bastar, Phulijher, Chandrapur, Padmapur, etc. and the states of Saraikela, Kharsawan and Sundergarh. The Odisha being dissatisfied at this continued their agitation with double vigor. The claims of the Odias were discussed at the Utkal Union Conference which met from year to year. Besides the Utkal Union Conference, the Odia Peoples¿ Association, the Balasore National Conference, the Udit Club of Singhbhum, the Utkal Milan Samaja and the Utkal Hitaisini Samaja of Ganjam also played leading roles for the union of the Odia-speaking areas. A counter movement called the Ganjam Defence League was organized by the Telugus in Ganjam to oppose the Odia movement. In 1917 the Montagu-Chelmsford Commission visited India on the subject of self-Government. As regards Odisha, the Commission in its report recognized the need for an administrative union of the Odia-speaking people and recommended for a sub-province for the Odias. But in the Act of 1919, there was no provision for a separate sub-province and the merger of the Odia-speaking areas. The question of amalgamation of the Odia-speaking people was discussed from time to time in the Central and the Provincial legislations. On the 20th February, 1920 Satchidananda Sinha moved a resolution in the imperial Council for the amalgamation of the Odia-speaking tracts. A similar resolution of A.B. Latthe supported by Brajasundar Das was moved in the Indian Legislative Assembly on the 2nd September, 1921. In reply Sir William Vincent, the Home Member, expressed his inability to take any step to change the provincial boundaries. On the 25th November, 1921, Viswanath Kar, an Odia member in the Bihar and Odisha Legislative Council moved a resolution for the union of the Odia-speaking tracts. In the same year Sasibhusan Rath moved a similar resolution in the Madras Legislative Council. All these resolutions were disallowed by the Government. At last India Government appointed C.L. Philip and A.C. Duff to make an enquiry regarding the attitude of the Odia inhabitants of the Madras Presidency towards this merger with Odisha. 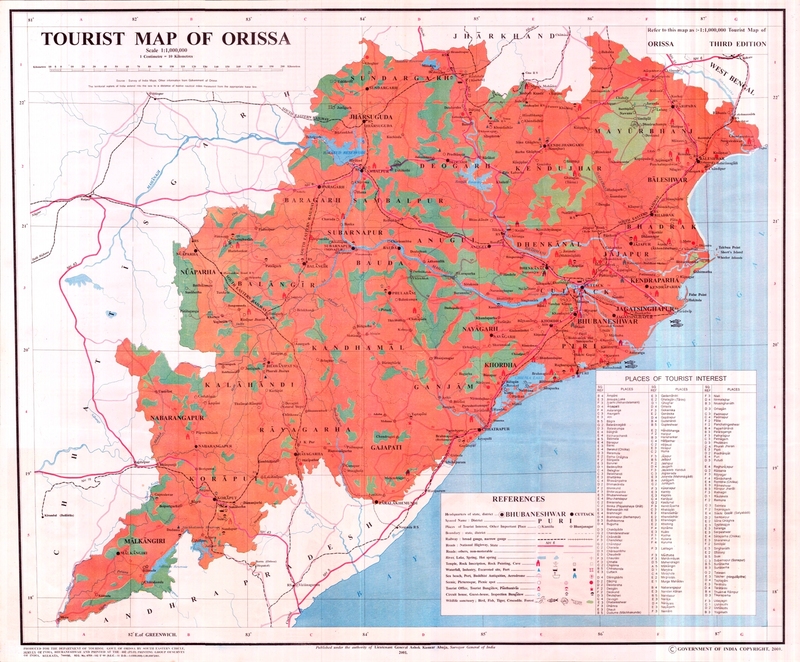 The Commission in their report made the following concluding remarks "Our enquiry has shown that there is a genuine long-standing and deep seated desire on the part of the educated Odia classes of the Odia-speaking tracts of Madras for amalgamation of these tracts with Odisha under the administration". Before any step was taken on the recommendations of the Commission, the Government appointment a statutory commission in 1928 under the Chairmanship of the Sir John Simon to report on the working on the reforms in India. The Commission in its report stated, "Bihar and Odisha is a glaring example of the artificial connections of areas which are not naturally related." The Commission, therefore, appointed a sub-committee for Odisha with Major Attlee as Chairman. The sub-committee recommended the creation of a separate Odisha province. A new awakening was marked in Odisha after the `Na Anka¿ famine of 1866 and during the time of the `language agitation¿. Growth of education, development of communication, increase in the volume of trade and commerce, establishment of printing press and publication of journals and periodicals paved the way for the growth of political consciousness in Odisha. This consciousness made the people aware of administrative disadvantages. The tales of the woes of the scattered Odias under other neighbouring people and their strong desire for union with Odisha crowded the columns of the newspapers and journals. When Lord North Brook, the Governor-General, suggested to break up the Central Province and to merge its areas with other provinces, the pioneers of the Odia movement advocated strongly merging Sambalpur with Odisha. The question of amalgamating outlying Odia-speaking tracts with Odisha was so far confined to newspapers and journals but later steps were taken to submit representations to the Government to that effect. When John Beams was the Commissioner of Odisha, the Odias appealed to him for the merger of the Odia-speaking areas into a distinct linguistic unit. The people of Balasore made a similar representation to Richard Temple, the Lieutenant-Governor, who did not pay any heed to that appeal. In 1876, Raja Baikunthanath Dey of Balasore and Bichitrananda Das, the Sirastadar of the Commissioner of Odisha, made a representation to the Government for the union of all the Odia-speaking areas under a single administration. Master in the art of writing short stories, he injected a new life in Odia literature in an environment of gloom and despair. His sense of humor remains unsurpassed in Odia literature. Discarding romantic themes, he wrote about the common man and his problems. Senapati could rightly be compared with the 20th Century great novelist like Premchand and Bibhutibhusan Banerjee. Even though he had no formal education, he proved to be an enlightened teacher, painter and a great administrator. In his writings, Odia Nationalism was the dominant theme. As a recognized literary poet, Senapati has made his place secure as a great prose writer in Odia. First ever Odia to get the Degree of M.A. B.L. from Calcutta University. Took a valiant stand for unification of scattered Odia tracts. Emerged on the Eastern horizon as a symbol of new hope and aspiration of all Odias. Was the founder of Utkal Sammilani, architect of Odia movement and pioneer in the field of industrial development. Acclaimed as a great Legislator and Journalist, he was the first Odia to be the member of Legislative Council and Member of Central Legislative Assembly and was the first to sail overseas. He had the distinction of being the first Indian Minister. Chandra Sekhar Behera of Sambalpur was a leading freedom fighter and an active participant in the Non-Cooperation Movement. He consolidated the National freedom movement in Sambalpur region and merged his activities with the Indian National Congress. He was a founding member of the National School of Sambalpur started on lines of Satyabadi Vana-Vidyalaya founded by Gopabandhu Das. As the chairman of Sambalpur Municipality, he received Gandhi in Sambalpur in 1928. Organized a mass movement against illiteracy and untouchability. Aptly described as the Gandhi of Odisha, Pandit Gopabandhu Das played a pivotal role in the formation of a separate province of Odisha. Born and brought up in an atomsphere of Brahminical orthodoxy, he shattered the shackles of narrow caste barriers. A Law Graduate from the Calcutta University. He was an active sentinel of Odia Movement, Freedom Fighter and a great social reformer. As an educationist he was responsible for establishment of Satyabadi School at Satyabadi in the Puri District. Imbued with patriotic fervor the students of Satyabadi School were known as indefatigable fighters against British Imperialism. Gopabandhu regarded politics as an instrument of service to the people. In the words of Mahatma Gandhi, Gopabandhu was one of the Noblest Sons of Odisha. His spirit of service and sacrifice finds an apt echo in his following lines. "Let my body mingle in the dust of my motherland and let my countrymen walk across it". Secured M.A. Degree in Philosophy from Calcutta University. Spurned an offer of a lucrative job by the British Govt. and preferred to serve as the Mead Master of Satyabadi High School. Endowed with a profound erudition he became a legendary figure in his life time. A powerful speaker, his speeches in Central Legislative Assembly and Odisha Legislative Assembly have left an indelible impression on Legislative history. He was a rare amalgam of a Writer, Editor, Speaker and Author. Author of an excellent commentary of The Bhagwad Geeta. His epics are considered as Master Piece of Odia Language. A distinguished freedom fighter and a revolutionary, he inspired the youth to fight against untouchability and other social evils. Led the movement for amalgamation of outlying Odia tracts and was a symbol of Odia culture. An eminent Freedom Fighter, able Statesman, remarkable Administrator, astute politician and a Charismatic leader. He was elected as the president of the Ganjam District Board in the year 1920 and joined the Non-cooperation movement in response to the call of Mahatma Gandhi in 1921 after giving up his lucrative law practice. Continued to be a member of Madras Legislative Assembly from 1921 to 1930. Gave up the membership of the Madras Legislative Assembly in 1931 and joined Salt Satyagraha. As a great Patriot led the peasant movement and fought for the creation of a separate Odisha Province. He had the distinction of being elected as Prime Minister of Odisha. Resigned from Prime Minister ship on 4th November 1939 at the bidding of Indian National congress. In 1950 got elected to Lok Sabha and became the President of Utkal Pradesh Congress Committee. He was appointed as the Governor of Uttar Pradesh. A noble son who has left an indelible impression on a resurgent Odisha. An Architect of modern Odisha. He attended the first Round Table Conference in London on 16th November 1930 wherein he made a fervent appeal for creating a separate province of Odisha on the basis of Language and homogeneity. As an eloquent spokesman of Odias, he was felicitated by Madhusudan Das, the father of modern Odisha. As a scion of illustrious Ganga Ruler he espoused the cause of the poor and downtrodden. Later played an important role in bringing together the vivisected parts of Odisha and laid the foundation of United Odisha. He was a member of old Madras Legislative Council, a member of royal commission of Agriculture and a member of Odisha Legislative Assembly. He was twice elected as Prime Minister of Odisha. He was an Educationist, Freedom, Fighter, Social Reformer and a champion of the poor. He established a permanent theatre at Paralakhemundi for promoting cultural activities. Enthroned as Raja of Khariar, (present day Nuapada district), in 1921. A great patron of Art, Culture and Education. Sportsman of distinction, member of many committees and Organizations. Sponsored Scholarships for deserving students for higher education. Patronized "Beer Bikram Theatre" of Khariar, the first permanent Odia Stage in the State. Nominated member of Odisha Advisory Council. Elected to Odisha Legislative Assembly in 1937 and 1946 from Khariar Assembly Constituency. Played a pivotal role in formation of Odisha as a separate province in the year 1936. It was at his instance and under his enlightened leadership that Khariar Zamindari merged with the State of Odisha leading to full Statehood. Biju Pattanaik was a trained pilot of acknowledged competence. Had special interest in Science and Technology and was responsible for instituting the prestigious International Kalinga Prize. He was the pioneer of Industrial movement in Odisha and was the head of Air Transport command during the war (1940-42). An indefatigable freedom fighter, he led the underground movement for freedom of the country along with Shri Jayaprakash Narayan, Dr. Ram Manohar Lohia and others. Landed first platoon of troops in Srinagar during attack by Pakistani raiders. Succeeded in safely airlifting the Indonesia leaders during war. He was honored by the Indonesia Government as "BHUMIPUTRA". Elected to Odisha Legislative Assembly from 1952. Chief Minister of Odisha from 1961-1963 and 1990-1995. Member, Rajya Sabha 1980-1984 and 11th Lok Sabha from 1996-1997. Union Minister of Steel from July 1977 to January 1980. He had the distinction of laying the basic infrastructure for development of Odisha. Special mention could be made of Paradeep Port, MIG Factory at Sunabeda, Ferro Silicon Complex at Theruvali, Hydro Electric Power Project Balimela. Thermal Power Station, Talcher, Engineering College, Rourkela, Engineering College and Medical College at Burla, Express High Way linking Dairari with Paradeep, Sainik School, Regional College of Education, Bhubaneswar, Regional Research Laboratory of the Council of Scientific and Industrial Research, Odisha University of Agriculture and Technology and many others. He was a great visionary who worked relentlessly for the uplift of the people of Odisha.